2016-10-20 Assigned to NOXELL CORPORATION reassignment NOXELL CORPORATION ASSIGNMENT OF ASSIGNORS INTEREST (SEE DOCUMENT FOR DETAILS). Assignors: GALLERIA CO.
2018-04-16 Assigned to NOXELL CORPORATION reassignment NOXELL CORPORATION RELEASE BY SECURED PARTY (SEE DOCUMENT FOR DETAILS). Assignors: JPMORGAN CHASE BANK, N.A. The present invention relates to hair care compositions comprising chelants and methods for reducing oxidative hair damage. The compositions contribute to reducing the oxidative damage sustained by keratinous fibers such as human hair during bleaching, dyeing, perming or other oxidative treatments. The compositions according to the present invention also provide excellent color evenness and color fastness. The application is a continuation of International application PCT/US02/08482 (Case CM2517M2) filed on Mar. 19, 2002. Preferred aminocarboxylic chelants are diamine-N,N′-dipolyacid and monoamine monoamide-N,N′-dipolyacid chelants, salts thereof and derivatives thereof. Preferred polyacids contain at least two acid groups independently selected from the carboxylic acid group (—COOH), sulphonic group (—SO 3H), the o-hydroxyphenyl group, the m-hydroxyphenyl group and the p-hydroxyphenyl group. Suitable polyacids include diacids, triacids and tetraacids, preferably diacids. Preferred salts include alkali metal, alkaline earth, ammonium or substituted ammonium salts. 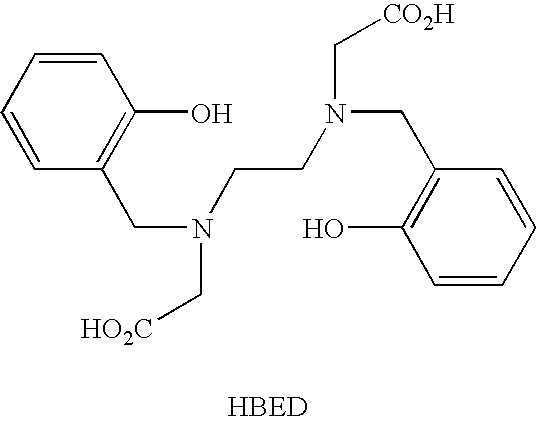 EDTA is a tetramonoacid and does not belong to this class of preferred chelants. Highly preferred for use herein is ethylenediamine-N,N′-disuccinic acid (EDDS), derivatives and salts thereof. Preferred EDDS compounds for use herein are the free acid form, and salts thereof. Preferred salts include alkali metal, alkaline earth metals, ammonium and substituted ammonium salts (e.g. monoethanolammonium, diethanolammonium, triethanolammonium). Highly preferred salts are sodium, potassium, magnesium and calcium salts. 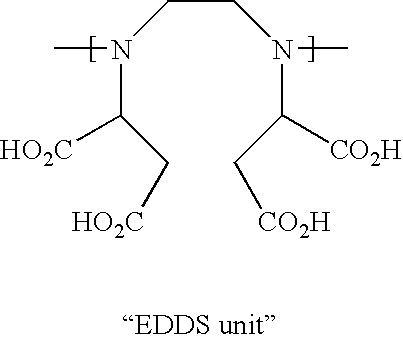 Examples of such preferred sodium salts of EDDS include Na 2EDDS and Na3EDDS. Suitable polyphosphoric acid type chelants include molecules that contain more than one P atom and have P—O—P bonds. Polyphosphoric acid chelants and salts (polyphosphates) can be linear and are generally represented by the formula [P nO3n+1](n+ 2)−M(n+ 2)+ wherein M is a suitable counter-ion such as H+, Na+ or K+ and n an integer. Polyphosphoric acid type chelants and their polyphosphate salts can also be cyclic and have the formula [PnO3n]n−Mn +. Representative examples include, among other, sodium tripolyphosphate, tetrasodium diphosphates, hexametaphosphoric acid and sodium metaphosphate. Good results such as those described above can be achieved by increasing the levels of previously used chelants or by using level of select chelants that were found to be particularly efficient even at low levels. These particularly efficient chelants have a much stronger affinity for transition metal ions such as Cu 2+ than for alkaline-earth metal ions such as Ca2+ at pH 10. One relatively easy way of predicting how well a chelant will perform is calculating the ratio of the log of the Conditional Stability Constant of the chelant for Cu2+ to the log of the Conditional Stability Constant of the chelant for Ca2+ at pH 10 as described below. It is preferred that the complexes formed by these preferred chelants efficiently inhibit the red-ox chemistry of Cu 2+. The ability of chelants to inhibit the red-ox chemistry of the chelated copper metal ion can be effectively compared using their Hydrogen Peroxide Decomposition Ratio (% Loss) as measured by the Hydrogen Peroxide Decomposition Ratio Measurement Protocol described hereafter in the “EXPERIMENTALS” section. MGDA is methylglycinediacetic acid and forms a pentadentate complex with Cu 2+. Chelants forming hexadentate type complexes with Cu 2+ were found to adequately inhibit the red-ox chemistry of the metal ion (“hexadendate complex” means that the chelant forms six bonds with the chelated metal ion). Examples of chelants that form such complexes with Cu2+ are EDDS, HBED, EDTA and EDDHA. Forming such complexes efficiently prevents the chelated heavy metal ion from reacting with the molecule of the oxidizing agent, for example hydrogen peroxide. Without being bound by theory, it is believed that chelants act to chelate environmental and intrinsic heavy metal ions such as iron, manganese and copper. In the absence of chelants, these heavy metal ions react with hydrogen peroxide to give highly damaging species such as free radicals, which are believed to be very harmful to the disulphide bonds of hair. It is believed that alkaline-earth metal ions such as Ca 2+ compete with heavy metal ions to form complexes with the chelants, therefore chelants with a much higher affinity for Cu2+ than for Ca2+ will much more efficiently prevent oxidative damage than chelants with a lower relative affinity for Cu2+. The Applicant believes that the importance of measuring damage under real life conditions (i.e. at pH 10 and with non-deionized water) was never recognized or foreseen until now. 2 g Of the bleaching composition per g of hair to be treated was applied on the hair switches and massaged in thoroughly. The hair switches were then wrapped in a plastic film and put in an oven at 30° C. After 30 nm, they were removed from the oven and from the wrapping film and rinsed for 1 mn in water. 0.1 g of shampoo per g. of hair was then added and milked for 30 s at a rate of at least 150 strokes a minute before rinsing for 30 s. The combined concentration of calcium and magnesium ions (water hardness) of the water used during all experiments (except for the preparation of the compositions tested, wherein water was distilled or dionised) was carefully kept at 9 grains per gallon (153 ppm), with a molar ratio of Ca 2+/Mg2+ equal to 3:1. The concentration of copper (Cu2+) ions was kept at about 1 ppm (+/−10%), the exact concentrations being measured by a standard analytic method. The rinsing water flow was adjusted to 6 liters per minute). The same shampooing and rinsing process was repeated another time (this is the “Oxidative Hair Treatment Protocol With 2 Intermediate Washes” referred to in the claims) or 9 additional times (this is the “Oxidative Hair Treatment Protocol With 10 Intermediate Washes” referred to in the claims) depending on the Damage Assessment Protocol used. The excess water was then squeezed out of the hair, and the hair dried with a fan. Any standard shampoo can be used in this protocol as long as it is free from transition metal ions such as copper ion and that the level chelants is less than 0.1% by weight of the shampoo. Prell® shampoo was using during these tests. Damage caused to the hair was assessed by the FT-IR (Fourier Transform Infrared) method, which has been established to be suitable for studying the effects of oxidative treatments on hair (Strassburger, J.,  J. Soc. Cosmet. Chem., 36, 61-74 (1985); Joy, M. & Lewis, D. M., Int. J. Cosmet. Sci., 13, 249-261 (1991); Signori, V. & Lewis, D. M., Int. J. Cosmet. Sci., 19, 1-13 (1997)). In particular, these authors have shown that the method is suitable for quantifying the amount of cysteic acid that is produced from the oxidation of cystine. In general, the oxidation of cystine is thought to be a suitable marker by which to monitor the overall oxidation of the keratinous part of the fiber. wherein said chelant is in an amount sufficient to provide a damage benefit of less than about 160 cysteic acid units as measured by the FT-IR Damage Assessing Protocol after a 5-Cycle Oxidative Hair Treatment Protocol With 2 Intermediate Washes, as described herein. 2. A composition according to claim 1, wherein said damage benefit is less than about 110 cysteic acid units. ratio calculated at pH 10 of at least about 3.20, wherein log KCuL is the common logarithm of the Conditional Stability Constant of said chelant with Cu2+ and log KCaL is the common logarithm of the Conditional Stability Constant of said chelant with Ca2+. 4. A composition according to claim 3, wherein said chelant (L) has a Hydrogen Peroxide Decomposition Ratio (% Loss) of less than about 10% as measured by the Hydrogen Peroxide Decomposition Ratio Measurement Protocol, as described herein. 5. A composition according to claim 3, wherein said chelant forms a hexadendate complex with Cu2+. 6. A composition according to claim 3, wherein said chelant (L) is an aminocarboxylic acid chelant selected from the group consisting of diamine-N,N′-dipolyacids, monoamine monoamide-N,N′-dipolyacids and N,N′-bis(2-hydroxybenzyl)ethylenediamine-N,N′-diacetic acid (HBED), and salts thereof, derivatives thereof and mixtures thereof. 7. A composition according to claim 6, wherein said aminocarboxylic acid chelant comprises at least two acid groups independently selected from a carboxylic acid group (—COOH), a sulphonic group (—SO3H), an o-hydroxyphenyl group, a m-hydroxyphenyl group, and a p-hydroxyphenyl group. 8. A composition according to claim 7, wherein said aminocarboxylic acid chelant is selected from the group consisting of ethylenediamine-N,N′-disuccinic acid (EDDS), ethylenediamine-N,N′-diglutaric acid (EDDG), 2-hydroxypropylenediamine-N,N′-disuccinic acid (HPDDS), glycinamide-N,N′-disuccinic acid (GADS), ethylenediamine-N-N′-bis(ortho-hydroxyphenyl acetic acid) (EDDHA), salts thereof, derivatives thereof and mixtures thereof. 9. A composition according to claim 1, wherein the pH of the composition is between about 8 and about 12. 10. A composition according to claim 1, wherein said composition is in the form of an oil-in-water emulsion. 11. A composition according to claim 1, wherein said composition is in the form of a thickened aqueous solution. 12. A composition according to claim 1, wherein said oxidizing agent is present at a level of from about 0.1% to about 40% by weight of the composition and is selected from water-soluble oxidizing agents and mixtures thereof. 13. A composition according to claim 12, wherein said oxidizing agent comprises hydrogen peroxide. 14. A composition according to claim 1, wherein said chelant is present at a level of from about 0.01% to about 10% by weight of the composition. 15. A composition according to claim 1, further comprising at least one oxidative hair dye precursor. wherein steps i) and iii) are separated by at least 1 day and step ii) does not take place immediately before step iii). 17. A kit for dyeing hair comprising a first and a second compositions packaged in different containers, wherein said first composition comprises an oxidizing agent and said second composition comprises an oxidative dye precursor, wherein the resulting mixture of said first and second compositions is a composition according to claim 15.
iv) rinsing off said composition with water. wherein said chelant is in an amount sufficient to provide a Normalized Shine Ratio of at least about 0.80 as measured by the Goniophotometer Damage Assessing Protocol after a 5-Cycle Hair Oxidative Treatment Protocol With 10 Intermediate Washes, as described herein. 21. A composition according to claim 20, wherein said chelant (L) has a Hydrogen Peroxide Decomposition Ratio (% Loss) of less than about 10% as measured by the Hydrogen Peroxide Decomposition Ratio Measurement Protocol, as described herein. 22. A composition according to claim 20, wherein said chelant (L) forms a hexadendate complex with Cu2+. 23. A composition according to claim 20, wherein said chelant (L) is an aminocarboxylic acid chelant selected from the group consisting of diamine-N,N′-dipolyacids, monoamine monoamide-N,N′-dipolyacids and N,N′-bis(2-hydroxybenzyl)ethylenediamine-N,N′-diacetic acid (HBED), salts thereof, derivatives thereof and mixtures thereof. 24. A composition according to claim 23, wherein said aminocarboxylic acid chelant comprises at least two acid groups independently selected from a carboxylic acid group (—COOH), a sulphonic group (—SO3H), an o-hydroxyphenyl group, the m-hydroxyphenyl group, and a p-hydroxyphenyl group. 25. A composition according to claim 24, wherein said aminocarboxylic acid chelant is selected from the group consisting of ethylenediamine-N,N′-disuccinic acid (EDDS), ethylenediamine-N,N′-diglutaric acid (EDDG), 2-hydroxypropylenediamine-N,N′-disuccinic acid (HPDDS), glycinamide-N,N′-disuccinic acid (GADS), ethylenediamine-N-N′-bis(ortho-hydroxyphenyl acetic acid) (EDDHA), and salts thereof, derivatives thereof and mixtures thereof. 26. A composition according to claim 19, wherein said oxidizing agent is present at a level of from about 0.1% to about 40% by weight of the composition and is selected from water-soluble oxidizing agents and mixtures thereof. 27. A composition according to claim 19, further comprising at least one oxidative hair dye precursor. 29. A kit for dyeing hair comprising a first and a second compositions packaged in different containers, wherein said first composition comprises an oxidizing agent and said second composition comprises an oxidative dye precursor, wherein the resulting mixture of said first and second compositions is a composition according to claim 27. DE4404177A1 (en) 1994-02-10 1995-08-17 Henkel Kgaa Stabilisation of aq. hydrogen peroxide prepns. MXPA03007843A (en) 2001-03-20 2003-12-08 Procter & Gamble Oxidizing compositions comprising a chelant and a conditioning agent and methods of treating hair. FI77572B (en) 1988-12-30 Foerfarande Foer faergning of Haor Science haorfaergningsfoerpackning.